Statewide snowpack basin-filled map March 27, 2019 via the NRCS. Westwide SNOTEL basin-filled map March 27, 2019 via the NRCS. As the water provider for homes and businesses from Vail through Edwards, we welcome each snowfall. Specifically, we focus on the water content — or “snow water equivalent” (SWE) — of our local snowpack. Statewide SWE is currently about 140 percent of normal and local snow measuring sites are similarly high. Above normal SWE generally bodes well for summer water supply. However, we need the snowpack to linger well into May. The federal snow measuring site on Vail Mountain normally peaks on April 25, then the melt starts. The Fremont Pass site near the headwaters of the Eagle River normally peaks on May 6, followed by a six-week melt. A slower melt lets water seep into soils — which were parched entering winter due to drought in 2018. While good winter snow should mean good summer river flows, some of that snowmelt will replenish soil moisture and not be part of spring runoff. Winter may be over, but the Eagle River valley needs April (snow) showers to bring May (river) scours. Why does Eagle River Water & Sanitation District care so much about local streams? Because they serve as the supply for us to provide you with clean, safe drinking water, irrigation water, and fire protection. The amount of water used by our customers affects local stream levels. Since healthy waterways are critical to our natural environment and recreation-based economy, we strive to balance the water needs of our customers with the rivers’ needs. In July 2018, as drought caused local waterways to drop to low levels, we prioritized river water over customers’ use of water for outdoor purposes. Outdoor areas use much more water than indoor areas and landscape irrigation has a greater impact on streamflows than indoor and fireflow use. Our staffcontacted hundreds of customers who were using excessive amounts of water that disproportionately impacted our community’s limited water resource. Nearly all customers who were contacted responded positively, which helped to preserve streamflows. …the moisture March has been delivering to Colorado has put an exclamation point on a stellar snowpack season. The state has experienced a remarkable turnaround from last year when poor snowpack and meager rainfall left the state deep in drought. “There are lingering effects (of that drought) for sure, but as far as the snowpack goes, it’s really the best that we can hope for,” said Taryn Finnessey, climate change risk management specialist for the Colorado Water Conservation Board. As of Wednesday, statewide snowpack averaged 140 percent of median. “It’s been a very good water year,” Dennis Phillips, a meteorologist for the National Weather Service in Grand Junction, said of the 12-month hydrological period that began last Oct. 1. 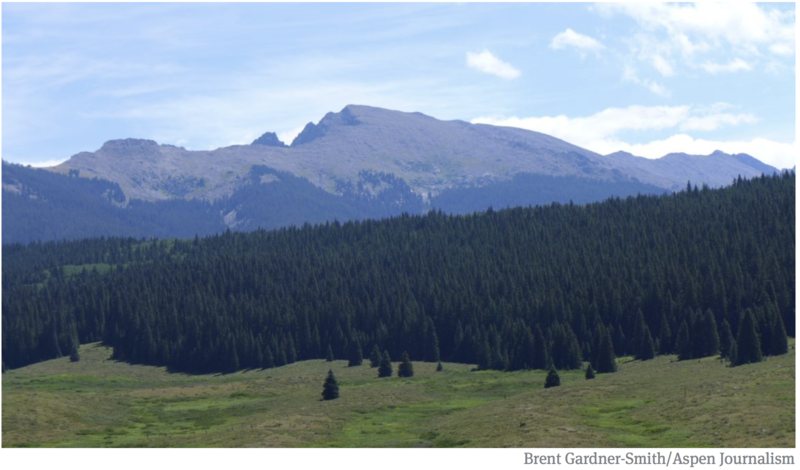 According to a March drought update produced by the board, since Feb. 1 the San Juan Mountains have received 15 inches of precipitation, nearly equal to the entire total they received during the 2018 water year that ended Sept. 30. River basins in far-southwest Colorado on Tuesday had a combined median snowpack of 161 percent of average, according to the Natural Resources Conservation Service. The Gunnison Basin, which was water-starved last year, is at 154 percent of median, and the upper Colorado River Basin is at 136 percent. The Weather Service is reporting that precipitation so far this month in Grand Junction has totaled 2.28 inches, just 0.08 inches behind the record of 2.36 set more than a century ago, in 1912. Local weather records date back to 1893. Record-setting or not, such moisture in Colorado has gone far to alleviate drought conditions in the state. Three months ago two-thirds of the state was experiencing some level of drought, according to the U.S. Drought Monitor. That was down to just under a third of the state as of March 12, and about 7 percent as of the latest drought report last week, with drought conditions remaining in parts of southern Colorado. The massive, 940,700 acre-foot reservoir’s level has fallen to around 30 percent of capacity, and hasn’t been that low since 1977. Now Colorado snowpack levels are high enough that water officials are at least considering the potential for flooding this spring. “Right now we’re not overly alarmed. We’re just going to see how it plays out,” Finnessey said. She said streamflow forecasts are average to just above average at this point. “Typically snowmelt is rather well behaved in Colorado,” she said. She said most of the state’s flooding results from rain, not snowmelt runoff. In addition, it remains to be seen how much of the runoff goes toward refilling reservoirs versus swelling streams. But Finnessey said officials are looking forward to the ecosystem and reservoir benefits the snowmelt will provide. But she said the drought’s impacts aren’t over, as in the case of ranchers who had to sell livestock last year. Poor hay-growing and range forage conditions took a heavy toll on many of them. What does that mean for Denver Water customers? There is still a lot of snow that has to melt. How will that impact reservoir capacity? Hartman: We will be able to fill our reservoirs and we’ll be able to use that water throughout the summer. We’re in late March right now, it’s obviously always difficult to predict how things will unfold. We could, say for example, have a warm April. A warm April would melt that snow off more quickly. Because of a number of dry years in the last 10 and 20 years, we have low soil moisture and Mother Nature gets dibs on that water. So, even with that great snowpack, some of that’s going to get eaten up by that very thirsty soil. You can always get evaporation if the weather gets very hot, or we could have a cooler April, which we hope for. That slows the melt off and sort of sustains the reservoir that is the snow. We consider the snowpack one giant reservoir. We are optimistic that we will continue to see these weather patterns that keep the snowmelt happening in a slower, more predictable, and more manageable way. In low snow years like last year, the effects to our community can be felt immediately from the loss of revenue from ski tourism to low flows in our rivers in the following hot summer months leading to voluntary fishing closures and a lackluster whitewater season. Our angling, boating, recreation, wildlife and aquatic communities all feel the impact. While it seems Ullr has different plans this year, as we are in the midst of back-to-back storm cycles refreshing our snowpack and currently putting us at about 136 percent of normal, we aren’t nearly in the clear of the drought in the Colorado River Basin, or its long-term companion, aridification. Research shows earlier runoff timing, higher ambient air temperatures, the dust-on-snow effect, and lower flows aren’t just periodic concerns, but more a representation of our new normal. The Eagle River and its tributaries support a wide array of uses inextricably tied to the wellbeing of our local economies and our high quality of life, not limited to: drinking water, agriculture, boating, angling, wildlife and biodiversity, aesthetics, lawns and gardens, snowmaking, and industry and power production. The effects of climate change, coupled with increasing demand from our ever-growing population, and the likelihood of future water storage projects, underline the need to plan for our community’s water future. The Eagle River Watershed Council — with the help of its many community partners and stakeholders — has undertaken an exciting initiative to be on the forefront of water management planning and engage the community through the Eagle River Community Water Plan. While the council has undertaken successful planning and assessment initiatives in the past, including the Eagle River Watershed Plan and the Colorado River Inventory & Assessment, these completed plans have largely focused on water quality issues in our watershed. The Community Water Plan will place a greater focus on future water quantity issues and will address increasing demand shortage scenarios. What is a community water plan? Colorado’s Water Plan, adopted by the state in 2015, set a goal of communities implementing community water plans, also known as stream management plans, on 80 percent of Colorado’s locally prioritized streams by the year 2030. The plan seeks to identify the desired environmental and recreational flows in our watershed and will provide the opportunity to safeguard the environmental, recreational, agricultural, tourism, and municipal uses of the river. In other words, the plan will allow for the protection of river health as well as the other uses of water the community values. Focusing on the entire length of the Eagle River, from its headwaters on Tennessee Pass to the confluence with the Colorado River in Dotsero, the plan will consider past, present, and future human and river health values to identify opportunities to correct historical degradation and mitigate against non-desirable future conditions due to stressors such as climate change and population growth. The plan’s diverse stakeholder group includes: local governments, fishing and rafting guide companies, the Eagle County Conservation District, the Northwest Colorado Council of Governments, American Rivers, the National Forest Foundation, the US Forest Service, the Bureau of Land Management, Colorado Parks and Wildlife, the Colorado Division of Water Resources, and the Eagle River MOU partners, including Climax Molybdenum Company, Vail Resorts, the Colorado River District, the Eagle River Water & Sanitation District, the Upper Eagle Regional Water Authority, and the partners in Homestake Reservoir (the cities of Colorado Springs and Aurora). The plan will culminate in a set of recommendations for projects, policies or management actions that can be used to mitigate stressors and encourage land and water management actions that promote ecosystem health. The stakeholder group is committed to striving for equitable outcomes through engaging and listening to a broad range of community members. Community meetings will be held throughout the planning process to provide an opportunity for the community to engage in the process. Although the first round of community meetings were held in late February with presentations about the plan and current river conditions, the opportunity to submit formal input through online surveys still exists. To have a truly representative Community Water Plan, members of the community are encouraged to complete these surveys that inquire about how the community uses the river, and which degraded segments of and threats to the river are most concerning. A recording of the presentations, surveys (in English and Spanish) and more information are available online at http://www.erwc.org. The Watershed Council and its partners encourage the community to make their voice heard in this important planning process and to stay tuned for future community meetings planned for this summer. Eagle River Watershed Council has a mission to advocate for the health and conservation of the Upper Colorado and Eagle River basins through research, education, and projects. To learn more, call (970) 827-5406 or visit http://www.erwc.org. The U.S. Forest Service is questioning whether the Southeastern Colorado Water Conservancy District ever will be able to get approval to build six potential diversion dams and related tunnels and conduits in the Fryingpan River basin that are located on USFS land above 10,000 feet within the Holy Cross Wilderness. The opposition statement was submitted July 31 in response to a periodic diligence application filed with the water court by Southeastern on May 28. Southeastern is seeking to maintain its conditional water rights that are part of the Fryingpan-Arkansas Project. The rights were decreed in 1958. 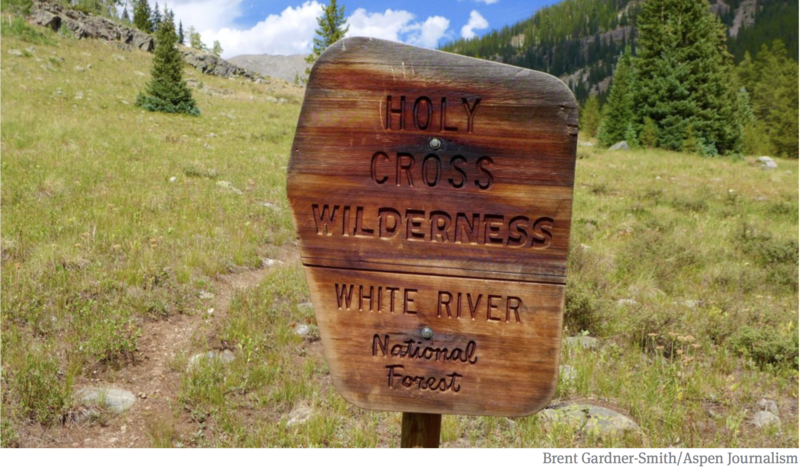 Six of the rights are within the Holy Cross Wilderness, which was designated in 1980, but most are outside of it. Southeastern, which is based in Pueblo, owns and manages the water rights for the Fry-Ark Project, which was built by the Bureau of Reclamation. 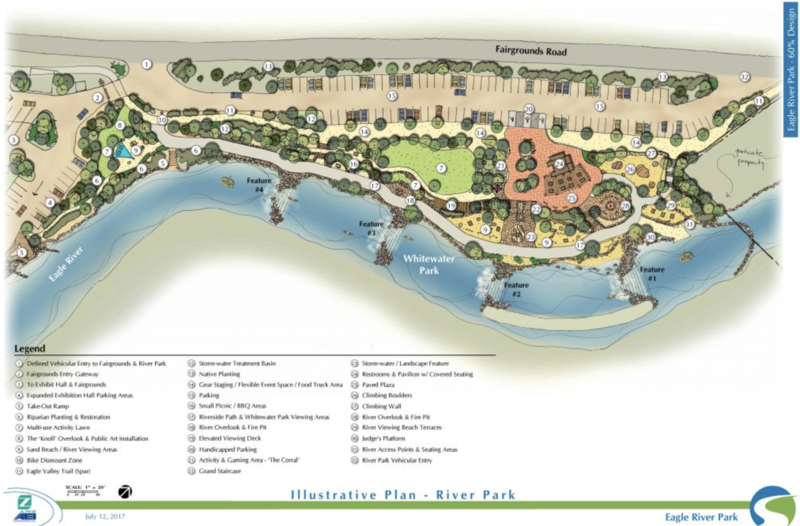 A detail of map of the Fry-Ark Project prepared by the Colorado River District, showing potential diversion points as purple circles. The map does not show the wilderness boundary. 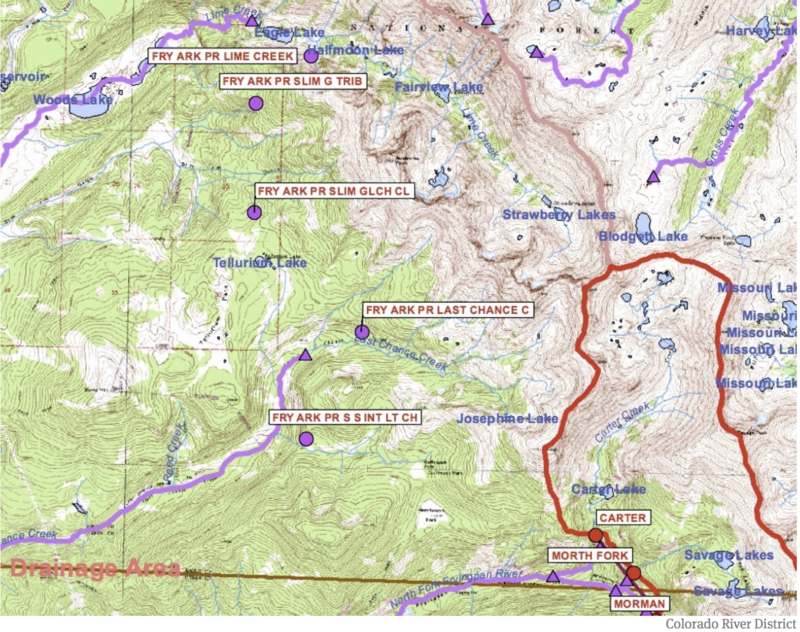 A map prepared as part of a study by Wilson Water Group showing the locations of six potential diversion dams in the Holy Cross Wilderness, shown in light purple. 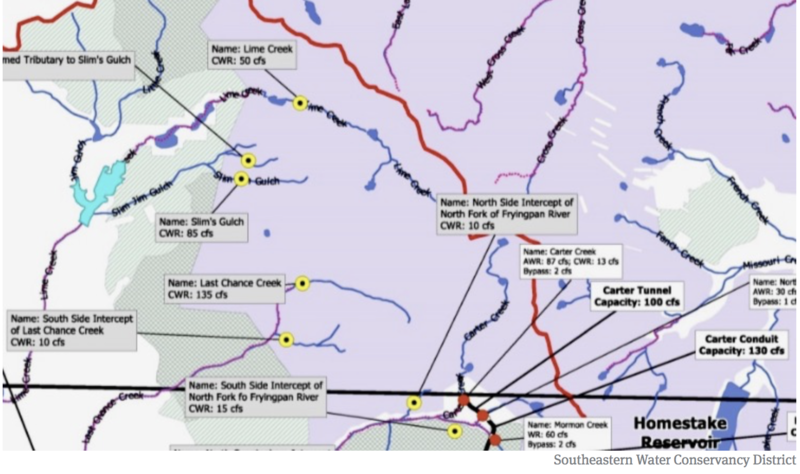 The diversion points would be connected with tunnels and conduits and connected to the existing Fry-Ark Project system at Carter Creek, the most northern dam and tunnel in the existing system. A map filed as part of Southeastern’s diligence application that shows the extent of the Fry-Ark Project. On its southern end, it diverts water from creeks near Aspen. 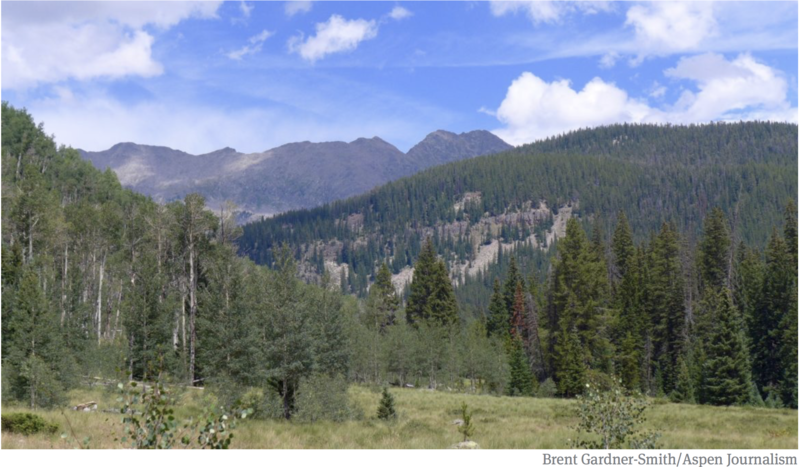 The conditional rights within the Holy Cross Wilderness are on its northern end. The six diversion dams inside the Holy Cross Wilderness would allow for the diversion of 10 cubic feet per second from an unnamed tributary of the North Fork of the Fryingpan River, for diversion of 135 cfs from Last Chance Creek and for 10 cfs from an unnamed tributary to Last Chance Creek, for 85 cfs from a creek called Slim’s Gulch and for 85 cfs from an unnamed tributary of Slim’s Gulch, and for 50 cfs from Lime Creek. In all, the six conditional rights in the wilderness would allow for 375 cfs of additional diversions in the Fry-Ark Project. The diversion structure on Lime Creek would be near pristine Halfmoon Lake, which is above Eagle Lake. The entrance to the Chapman Tunnel on the creek in Chapman Gulch, part of the existing Fry-Ark diversion system. The Fry-Ark Project today includes 16 diversion dams and 26 miles of tunnels and conduits on the Western Slope that move water from the Hunter Creek and Fryingpan River basins to the centrally located Boustead Tunnel, which can divert as many as 945 cfs under the Continental Divide. The water is sent to Turquoise Reservoir near Leadville and then farther into the Arkansas River basin for use by cities and irrigators. The six potential dams and tunnels in the Holy Cross Wilderness would connect to the existing Fry-Ark Project at the Carter Creek dam and tunnel, which is the most northerly point of the system. It was completed in 1981. James DuBois, an attorney in the environment and natural resources division at the Justice Department and who filed the USFS statement of opposition, said he could not discuss the case. DuBois filed a similar statement of opposition in a 2009 diligence filing for Southeastern’s conditional rights. In that case, the USFS eventually agreed, in a 2011 stipulation, that Southeastern would study “the potential for moving its conditional water rights off of wilderness lands” during the next six-year diligence period, which ended in May. A view of the Slim’s Gulch area in the upper Fryingpan River basin. The Lime Creek basin is on the other side of the jagged ridge in the background, and a tunnel under the mountain would move water from Lime Creek to Slim’s Gulch. 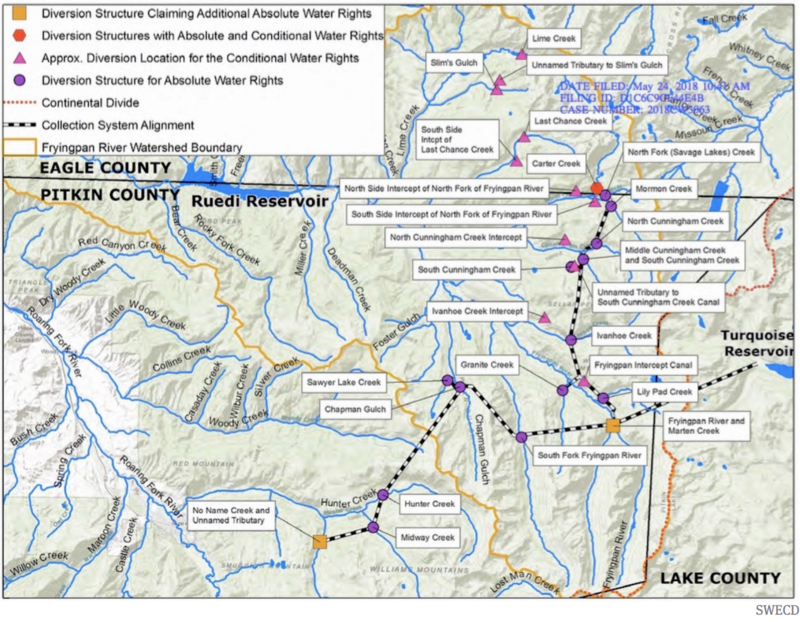 Under the project’s operating principles, the authorized yield of the Fry-Ark Project is limited to diverting 120,000 acre-feet in any one year, and to diverting no more than 2.35 million acre-feet over a 34-year rolling average, or an annual average of 69,200 acre-feet. From 2010 to 2015, the project diverted an average of 63,600 acre-feet, indicating there is more yield to be gained. This year, a dry year, about 39,000 acre-feet was diverted. 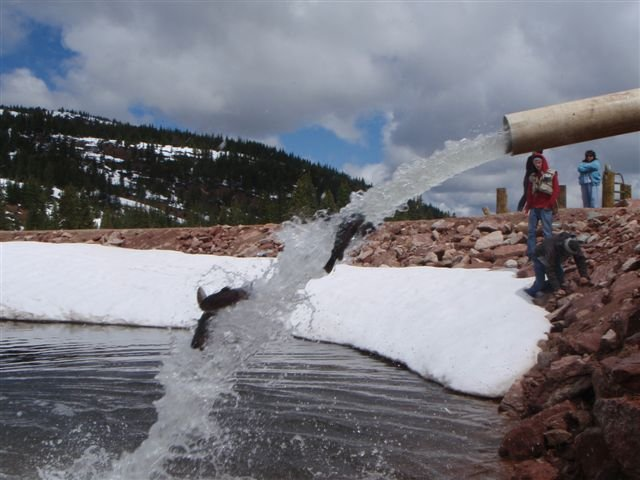 In 2011, the last really wet year, 98,900 acre-feet was diverted, according to an annual report on the Fry-Ark Project prepared by the Bureau of Reclamation. In accordance with the 2011 stipulation, a study on how to get more water out of the system was done by Wilson Water Group and presented to Southeastern in April. 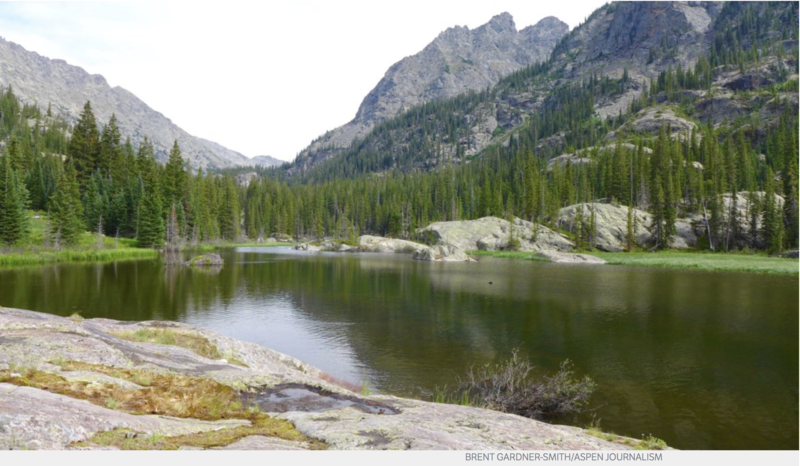 Upon learning of the diligence application this week, Will Roush, the executive director of Wilderness Workshop in Carbondale, said “the Holy Cross Wilderness is a completely inappropriate location” for the development of the conditional water rights. “Lime Creek, Last Chance Creek and the surrounding lands and tributaries provide amazing opportunities for solitude and the rare opportunity to experience a landscape and alpine watershed free of human infrastructure and without the diversion of water,” Roush said. An informational memo on the diligence case was presented to the Southeastern board of directors on Aug. 16, and there was no discussion of the case by the board. An initial status conference in the diligence case has been set for Sept. 18. Editor’s note: Aspen Journalism is covering the Roaring Fork and Colorado river basins in collaboration with The Aspen Times. The Times published this story on Saturday, August 19, 2018. This version of the story corrected the date of the earlier stipulation between Southeastern and USFS, which was reached in 2011, not 2012, when the case was closed. 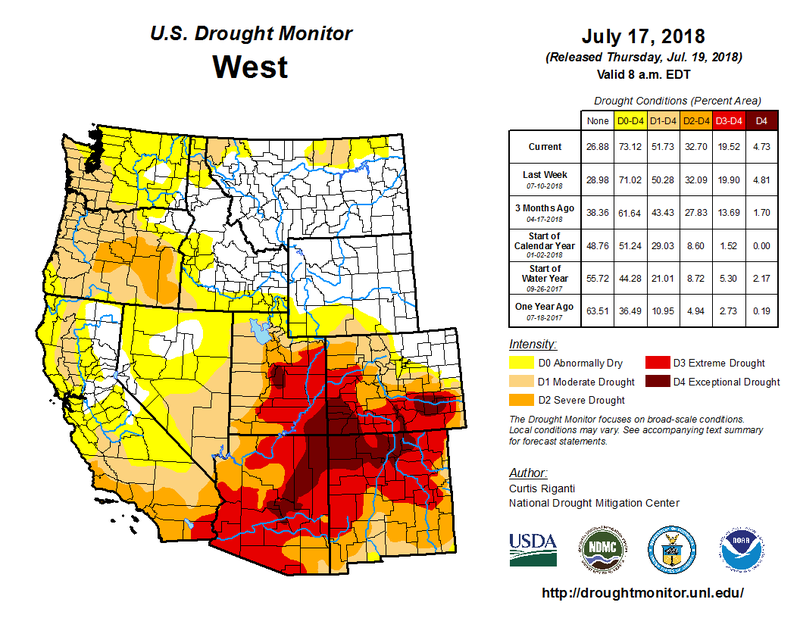 West Drought Monitor July 17, 2018. In a memo to the district’s elected board, communications and public affairs manager Diane Johnson wrote that streamflows measured on Gore Creek, the Eagle River near Minturn and the Eagle River at Avon are all running significantly below seasonal norms. 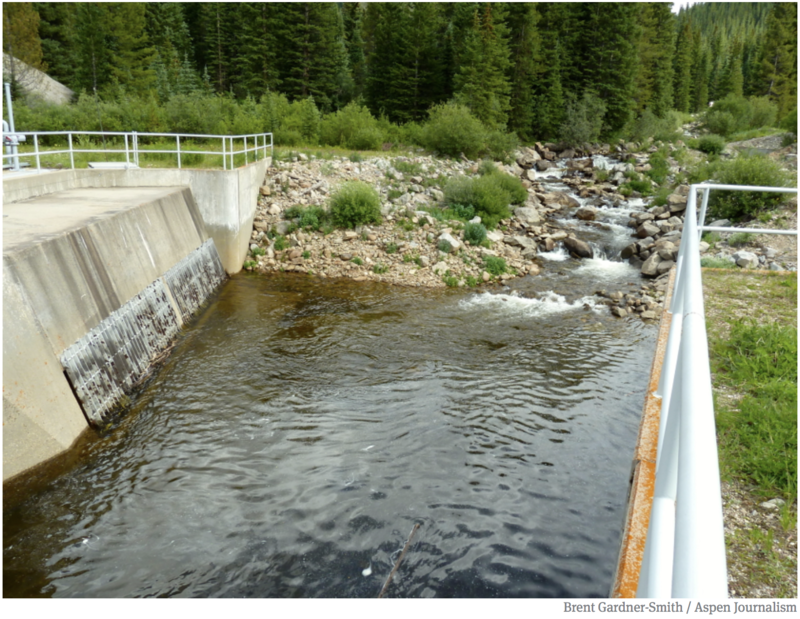 • Gore Creek was running at 36 cubic feet per second, 38 percent of the normal flow. 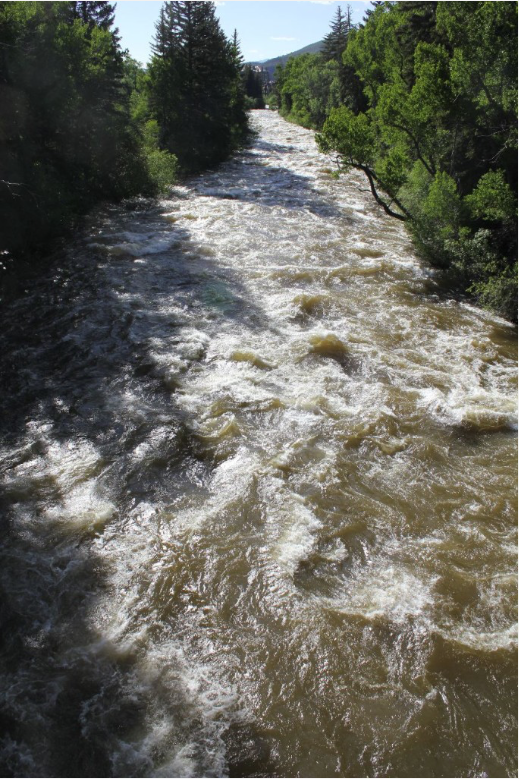 • The Eagle River near Minturn was running at 49 cfs, 43 percent of normal. • The river at Avon was running at 108 cfs, 36 percent of normal. Those readings are among the lowest on record. Only the drought years of 2002 and 2012 showed lower streamflows from April 1 to July 22. Even in those drought years, the graph lines show the occasional bump, when rainfall temporarily boosted streamflows. This year, those bumps haven’t developed. 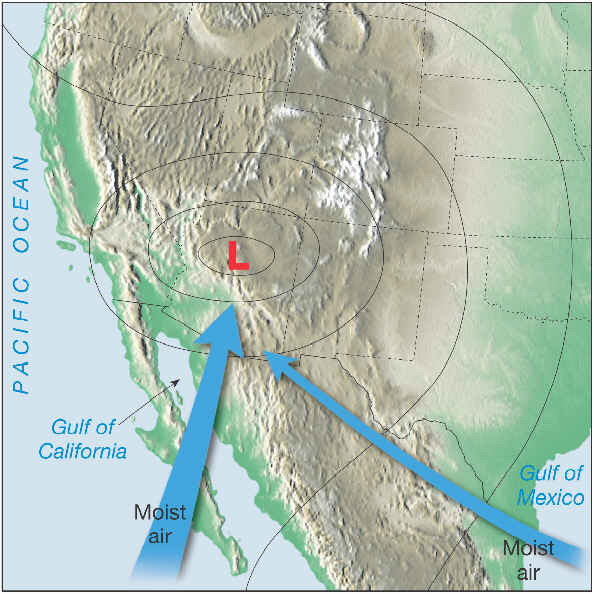 North American Monsoon graphic via Hunter College. The short boosts to streamflow in those other years started coming in about mid-June, the result of the annual “monsoon” flow that generally brings some significant moisture to the area. The U.S. Climate Prediction Center in late spring predicted a better-than-average change of precipitation into the summer. That hasn’t developed so far this year. Tom Renwick, a forecaster at the Grand Junction office of the National Weather Service, said the monsoonal flow in Western Colorado usually develops when a high-pressure system sets up over Texas and Oklahoma and a low-pressure system develops over the desert Southwest United States. When that happens, moisture is sucked up from the south and ends up being deposited in Western Colorado. Renwick said high pressure has been setting up in the wrong place so far this year. That high pressure usually means dry conditions. At the moment, high pressure is farther west than it needs to be to bring rain. “It’s basically on top of us,” Renwick said. While Western Colorado hasn’t been getting its usual summer rainfall, Renwick said other areas are seeing seasonal precipitation. The monsoons have hit Mexico. Locally, the lack of the monsoon rains is starting to concern water providers. That said, there are adequate supplies for domestic use. Aquatic life can be hard-hit by low streamflows, especially when those low flows are combined with warm temperatures. Colorado Parks and Wildlife last week called for a voluntary fishing closure on portions of the Eagle, Colorado, Crystal and Roaring Fork rivers. Anglers are asked to stop fishing from 2 p.m. to midnight on stretches of those streams. Water temperatures near or above 70 degrees Fahrenheit can be damaging to fish that are caught and released back into the water. Rainfall and cooler water temperatures are good for both aquatic life and landscaping. Until those rains come, though, district customers are being asked to let their landscaping dry out a bit. When the monsoonal flow might develop remains an open question, but Renwick said he’s optimistic. There’s a possible monsoonal pattern developing later this week for New Mexico, the Front Range and parts of Wyoming, but not Western Colorado. CPW is implementing voluntary fishing closures on sections of the Eagle River, Colorado River, Crystal River, and Roaring Fork River in northwest Colorado. Roaring Fork River, Grottos, on Monday morning June 13, 2016, looking downstream, with diversions into the Twin Lakes Tunnel at over 600 cfs. While impressive at this level, the whitewater frenzy that resulted after the tunnels were closed was far more intense. Photo Brent Gardner-Smith <a href="http://aspenjournalism.org&quot;.Aspen Journalism. Due to high water temperatures and low flows, Colorado Parks and Wildlife is implementing voluntary fishing closures between 2 p.m. – 12 a.m. on sections of the Eagle River, Colorado River, Crystal River, and Roaring Fork River in Northwest Colorado. The fishing closure is effective immediately, until further notice. Although anglers are not legally prohibited from fishing in these stretches, CPW is asking anglers to fish early in the day and find alternative places to fish until conditions improve. Roaring Fork River from Carbondale downstream to its confluence with the Colorado River. CPW will place signs along the four sections of rivers to notify anglers and encourage them to consider fishing at higher elevation lakes and streams where environmental factors are much less severe, particularly during the afternoons and evenings. 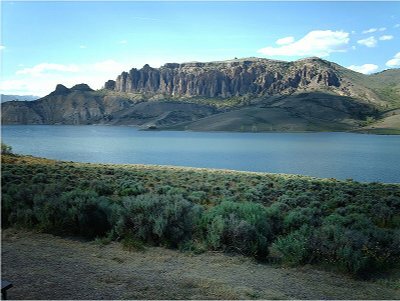 If current conditions persist, CPW may consider further fishing restrictions which may include all-day voluntary fishing closures or mandatory fishing closures. CPW recommends anglers contact their local CPW office for the most recent information relative to fishing closures, fishing conditions, and fishing opportunities.